Use fabric paint to add eyes, mouths, and sparkly costume details. Glue small rounded, felt triangle for nose. Cut long rectangles for hand, rounding the ends into hand shapes. Glue in sleeves. 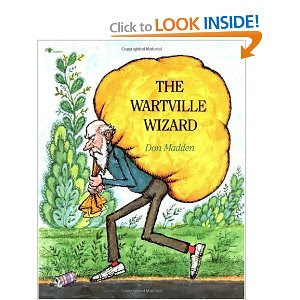 Here is a fun story for Earth Day about an old man who finally gets tired of picking up other people's litter, The Wartville Wizard by Don Madden. Mother Nature gives him Wizard Power to stick trash back to people that drop it. Little ones will get a kick out of the magic while learning about littering. And hey, maybe it could help with "littering" their possessions at home? 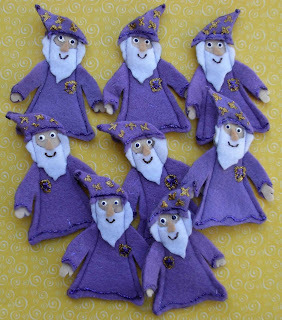 :) Mama needs wizard power!